Day 2 was a longer day than the first, travelling across the top of the escarpment. This day ended at Crystal Falls as the campground, although we actually didn't see any "falls" until the walk the following morning. 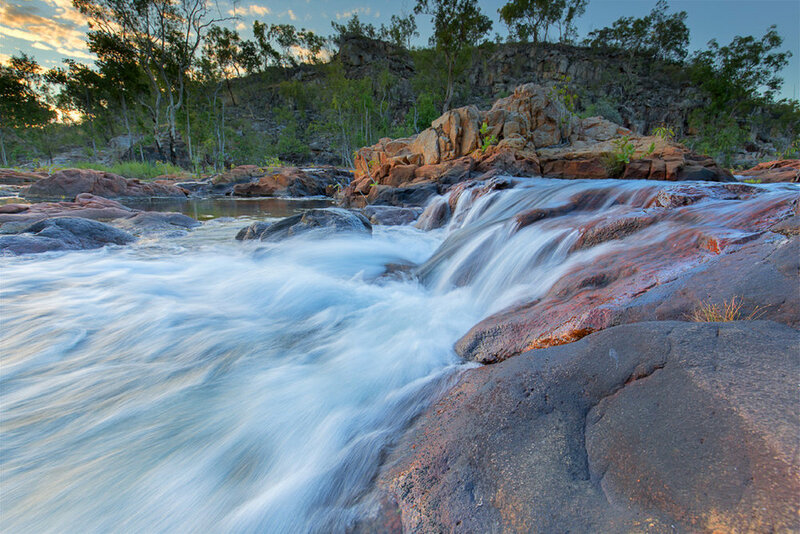 This beautiful creek was our home for the night, with our tent pitched right next to the croc-free water! You might be able to see the white spec in the photo on the other side of the creek - that's the arrow marking the route of the Jatbula trail... we had to cross this creek! My partner and I did a bag-less practice at rock hopping over this creek, in preparation for the morning all geared up and ready to go! I'm glad we did actually - I'm super uncoordinated on rocks at the best of times, let alone when I'm surrounded by water and walking on algae ha ha. The crossing was relatively easy in the end; a couple of wet ankles sections but the camera gear was safe and dry in the bag! Beautiful clear waters - we filled our water up every day from these beautiful waters. We used purification tablets for the first day but realised they weren't required. We were high on the escarpment, the waters were pristine! Shortly after crossing the creek the following morning, we were treated to the "real" Crystal Falls. 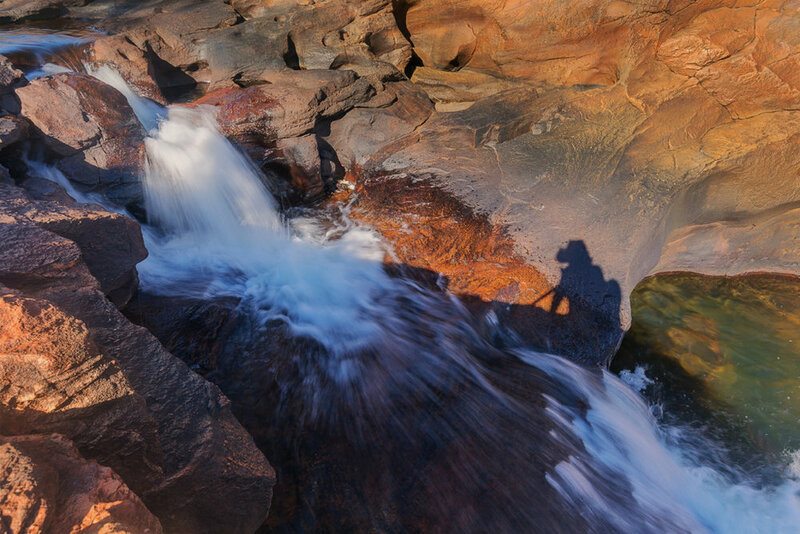 The Jatbula trail walks around the hill side and you quickly start hearing the sound of thundering water.... The falls were unexpectedly huge! The vantage point unfortunately was a bit too tree-ridden for a clean photo but the sight was certainly incredible! One thing I wish I had done (did I say this already?!) is bought a pocket-sized point-and-shoot camera for the moments and places I wanted to capture quickly without the hassle of the big camera. Day 3 ascended to the highest stretch along the Jatbula trail, and this was our hottest day. Atop the escarpment there was little shade; the woodland was open and the sun was hot! Our lunch stop for the day was the ampitheatre; a natural horseshoe shaped cliff creating a shady little monsoon pocket. Around the walls of the cliffs were Jawoyn Aboriginal paintings. Continuing along the trail for our remaining part of the day led us to an amazing view of 17 Mile Falls, from the escarpment opposite. This waterfall was more typical of the type I would expect to find in this region - a tall, straight, single drop waterfall. The water was still flowing well, and does flow throughout the year despite dropping as the flood waters slow. Our campsite for the night on day 3 of Jatbula was actually on top of 17 Mile Falls, so despite the great view we continued our walk around to the top of the waterfall. The top of the waterfall reminded me a little of the top of Gunlom with its tranquil "infinity pool". 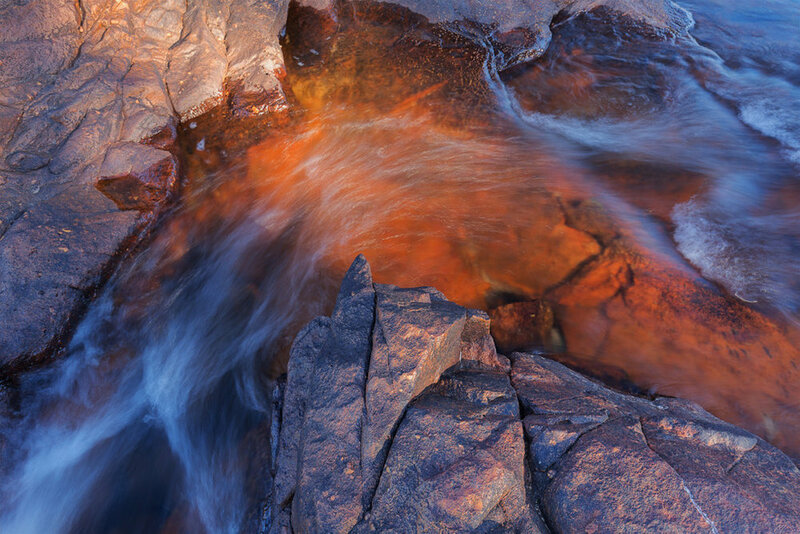 The curves of the cliffs and the rugged gorge created some interesting mini-waterfalls to photograph for the afternoon.